There’s been a lot of debate as to whether I should recommend real estate as an investment, given predictions of a 20% drop in housing prices. To prove that real estate can still be a smart investment decision I’ve examined potential returns of both…and the results may surprise you. Despite continuing predictions of a real estate crash in Canada, I still maintain that real estate is a good investment. One of the greatest benefits to real estate investing is that it’s probably one of the more accessible ways to invest using borrowed money. Any interest rate increase on the borrowed money cannot significantly impact a person’s ability to pay off the debt, or they may be forced to liquidate the asset at unfavourable rate/prices. I’m not the only one who believes this to be the case. Financial educator, author and industry consultant, Talbot Stevens, believes real estate can be a wise investment under the right circumstances. In an interview with Stevens in late 2011, he stated: “Real estate investing is like a mini-business that doesn’t have a lot of complexity to it. For the average person, real estate can be a good strategy.” His comments were in relation to the smart use of leveraged investing to increase your overall net worth. By strategically using leverage to invest in appreciating assets a person could essentially buy more net worth. At this point, however, it’s worth mentioning that while borrowing to buy an asset can magnify your gains, it can also dramatically accentuate your losses. To understand how this works consider what happens if you put 10% down on a property worth $300,000. Your original investment is $30,000. If the house goes up in value by $60,000 and you sell, you’ll make a $30,000 profit (before interest, taxes and expenses). Even though the house went up in value by only 20%, your return on investment is 100%—that’s how leveraging works. But what if the same $300,000 house drops in value by $60,000, and you sell. You won’t get any of your initial $30,000 deposit back and, worse, you’ll now owe $30,000 to the bank to pay off what you’re short on in the mortgage. While the investment only declined by 20%, you ended up in the red by 100%. Because of leverage you lost more than you initially invested. All this is great to know, but the real question is what should a homebuyer or real estate investor do now, when there are predictions of a housing crash, at worst, or stagnant appreciation, at best. One way investors can avoid these problems is to focus on cash-flow positive properties. That means the income you get from renting out the property covers all your expenses, including the mortgage, taxes, insurance, maintenance, repairs and a contingency fund. That way your property will be making money for you whether house prices go up or down—so hopefully, you’ll never be forced to sell in a down market. The homebuyer, on the other hand, is in a different position. Rather than buy based on metrics, homebuyers—people who a house solely as a place to live and not as an investment—buy based on emotions. These buyers ignore an up-and-coming neighbourhood to get into an established (and expensive) area; these buyers want the stainless steel kitchen appliances and granite counter-top and, often, pay little attention to the age of the furnace and whether you can undercut the asking price because of all the work that needs to be done to the property. In my opinion these buyers need to wait it out. To get a better idea of how the market impacts home prices and your net worth, I’ve put together a few simple scenarios. 4) Rent and invest the down payment in a balanced portfolio. The time-value of money is not factored in. That’s because regardless of whether you hold real estate or a stock portfolio, your equity will be impacted equally by rising inflation. The equity in your home would amount to just over $200,000 after 10 years (assuming no pre-payments and not accounting for maintenance and utility costs). But what if you were to buy the same $350,000 home, with 10% down and prices dropped 20%? Your initial investment would be $35,000 and the value of the asset at time of purchase would be $350,000. After the price drop your home would only be worth $280,000. If you were to sell within that first year, you would lose your initial investment of $35,000 and would owe an additional $35,000. The balance on the mortgage would remain the same, assuming no prepayments, with a balance of $226,398 owing at the end of year 10. However, the initial drop in the value of the house would significantly impede the asset’s appreciation over the 10 years, leaving you in a $9,000 deficit from when you first bought your home. (After 10 years, and 2% appreciation each year after the initial 20% loss in value, the home would be worth just over $341,000, or $9,000 less than when you first bought the home.) Over the 10 years, however, you would have built up about $115,000 in equity (the reduced home value after 10 years minus the outstanding mortgage balance). Same scenario as above, however, the price drop is only 10%. At the end of 10 years your asset would be worth just under $376,455 and the equity in the home would be just over $150,050. No question: the price drop significantly impacted the appreciation of the asset, but after 10 years of forced savings (i.e. : paying off a mortgage) you would just over $150,000 in equity in the home. Based on these returns, the maximum appreciation your portfolio could manage is just over $62,000 (not including taxes, dividend disbursements, additional contributions, or trading costs). But the ability to invest this money assumes that the $1,637 mortgage payment you would’ve been making had you purchased a home is a sufficient enough sum to rent an apartment. For those living in Toronto or Vancouver—or in Regina, Thunder Bay and Calgary, where vacancy rates are an astonishingly low 1% to 1.3%—the possibility of finding a two-bedroom apartment for $1,600 in the downtown core may seem ridiculous. Also, the above calculations, and the rent you start paying the year you make your investments, do not take into consideration the impact of rental increases. The long and short of it is this: real estate, as an investment, really only makes sense when the market is appreciating. Any loss in home value can really put a dent in your overall equity. If, then, you believe that the housing market will drop 20% in value, it would probably be best for you to continue renting and to invest your money in the markets. Of course, to maximize your savings you would need to find a rental that is less than what you would’ve paid in mortgage payments, and then invest the savings into your portfolio. Do this and you could see a potential nest egg between $124,000 and $132,000 at the end of 10 years. If, however, you don’t believe the housing market will take a 20% dive and like me, you believe there will only be a 10% correction in housing prices, if that, then investing in real estate isn’t such a crazy idea. Even if the real estate market did drop by 10%, you would have approximately $150,000 in equity in your home—about $20,000 more than if you had invested in the markets. 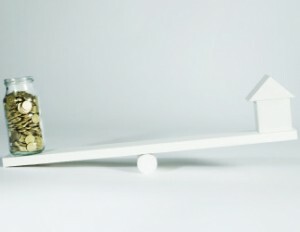 If the housing market doesn’t correct, you would have almost $70,000 more than if you’d invested in a balanced portfolio for the same time period. While, we can’t actually predict how the housing market or stock markets will perform over the next 10 years, we can make educated guesses. I simply wanted to show that despite loud headlines of potential bubbles bursting in the real estate market, housing is a good investment. I am not advocating that you should put all your eggs in one basket. If you own rental properties you should also diversify and invest in stocks and bonds (as well a REITs, mortgage investment products, as well as other investment products). I also believe that too many homebuyers read these reports and assume that any investment in a house is a good investment. That’s not always the case. In the end, a decision to invest in any product, whether real estate or in the markets, needs to be an educated decision based on a long-term financial strategy. It cannot be an emotional decision based on fear and speculation.